Wifi is available for free throughout Mountain View RV Park. 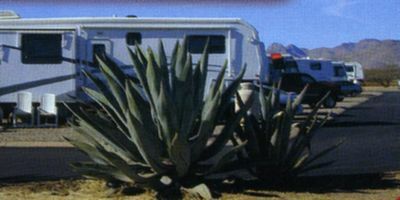 Stay with us at Mountain View RV Park when you are visiting scenic Southeastern Arizona. The park is located within view of five mountain ranges, all of which host beautiful canyons, old mining camps, historical sites and some of the richest varieties of bird specimens found anywhere in the U.S. Newly remodeled Mountain View RV Park has something to suit everyone, from drive-thru full hook-up sites complete with 50-amp service and concrete patio to our "tenters paradise" for those that choose to dry camp. And as a full service RV park we also offer year round RV and boat storage. View the park amenities page for a complete list and details of all the creature comforts Mountain View offers. Rentals Available. Contact us for details or to reserve your space!